A solid black opaque 6-sided dice with gold numerals. Standard 16mm in size. Speckled "Earth" 20-sided dice with green numbers. A set of 12 black high-quality dice with rounded corners. 16mm (or approximately 3/4 inches) is the standard size most commonly found in board games. Small but good quality, this 10mm (.4 inch) white dice has dark black indented spots. A bright red d10 with white numbers, built to last. Transparent orange 7-piece dice set with white numbers.Contains a d4, d6, d8, two d10s (a ones d10 and a percentile d10), a d12, and a d20. Shop our dice store for dice for games, games with dice, D&D dice, and all kinds of dice and game supplies! We're gaming dice specialists, D&D dice experts, dice game enthusiasts, and tabletop game aficionados! We're the best online dice store for gaming dice and D&D dice! We also carry a wide range of game supplies, playing cards, Bunco accessories, tabletop games, and even puzzles and educational supplies. But our specialty is dice. We have thousands of game dice for sale in a huge variety of colors, sizes and shapes, and you can buy them individually or in bulk. We have D&D dice sets, polyhedral dice, multi-dice, regular six-sided dice, and even math and language dice. Our gaming dice are the highest quality you can get anywhere. But like we said, we've got so much more than just dice for games. If you're looking for game supplies, such as tokens, pawns, sand timers, score cards, or dice bags, we have those as well. We also have tabletop board games for sale, including plenty of dice games as well as classic games, family games, strategy games, and card games. We even have casino and poker supplies, including a wide range of playing cards and poker chips. So no matter what kind of gaming dice or board game supplies you need, take a look around. We're more than just a dice store! Shop now to buy gaming dice for sale online! What kind of game dice do we sell here? All kinds. 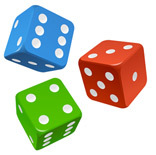 We work with the biggest dice manufacturers to bring you a wide variety of dice and dice related products. Buy dice by sides - d4, d6, d8, d10, d12, d20 and more! We've got plenty of 6-sided dice available, including standard pipped dice, numeral dice, math dice, and specialty dice, but we carry all the "weird" dice too: 4-sided dice, 10-sided dice, 12-sided dice, 20-sided dice, and many others. We have all kinds of dice for games in an array of colors so you can buy dice that meet your exact needs. Buy dice by size - 16mm, 12mm, 25mm and more! Buy dice ranging in size from 5mm to 100mm. If you're not sure what size of dice you need, check out our Dice Sizes page for photos and descriptions of the most common sizes of dice. 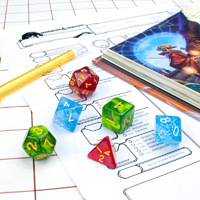 Whether you're new to Dungeons and Dragons or any other role-playing game, or whether you're an old pro looking for a set of dice to liven up your game, you'll find a huge variety of D&D dice sets for sale on our site. You'll also find plenty of individual polyhedral dice as well, letting you buy dice one at a time or in bulk. Speaking of buying dice in bulk, many of our game dice can be purchased in large quantities ranging from hundreds to thousands of dice. 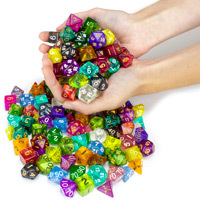 In addition to carrying a wide variety of dice, we sell only the highest quality dice for games. Seriously. So if you're shopping for dice made of cheap materials that will chip and wear quickly, or if you're looking for misshapen dice with poorly painted pips, badly spaced or even missing pips, ugly colors, or numbers that are hard to read, then we're sorry but you'll have to look elsewhere. We don't carry dice like that. Instead, the dice we have for sale are top-notch, high quality dice that will last for thousands of rolls. Even sides, well-painted pips, attractive colors... if you want great dice like that then you've come to the right place. We're the best online store for dice!